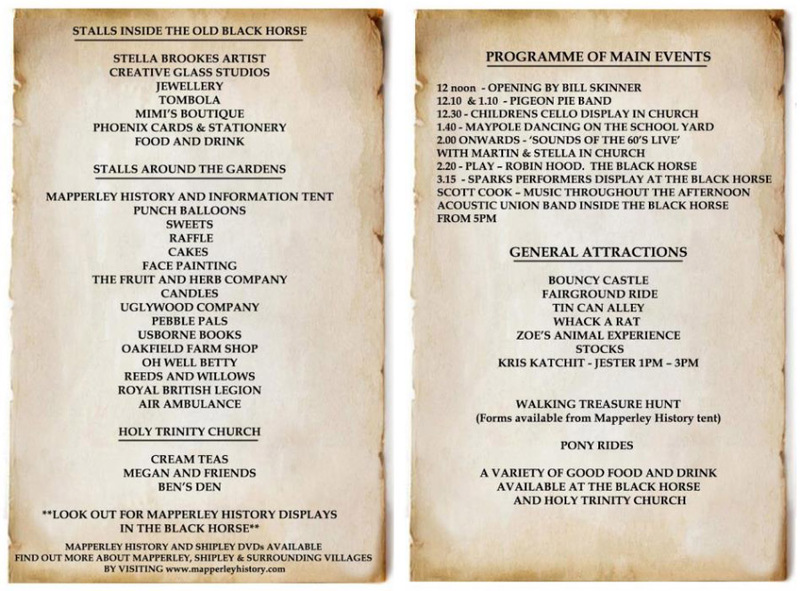 Mapperley History Project joined forces with The Old Black Horse, Holy Trinity Church Mapperley C of E. Primary School and PTA with support from Mapperley Parish Council to organise the event. Formerly known as Maperlie, the village is mentioned in the Domesday Book of 1086 and received its Royal Charter in 1267. 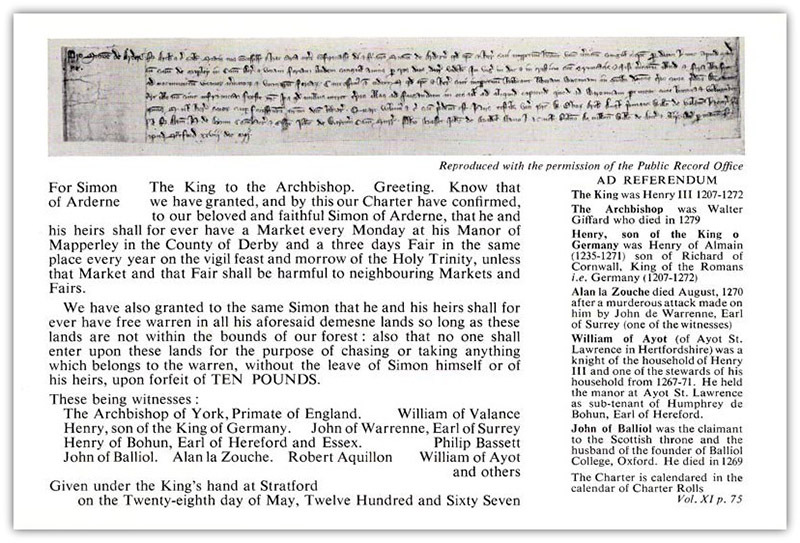 The document was granted to Simon of Arderne, then Lord of the Manor, allowing him to hold an annual fair on the festival of the Holy Trinity - this makes the event older even than Ilkeston Fair. The charter also permitted a weekly market every Monday. The village rose to further prominence in the 19th century thanks to the wealthy Miller Mundy dynasty of nearby Shipley Hall who made the bulk of their money from coal production. Mapperley Colliery, which was open from 1871 until 1965, became one of the area's major employers and at the height of its operation, the population of the village grew to around 531 people. A similar event held in 1967 to mark the 700th anniversary of the granting of the Royal Charter proved extremely successful. We very much hope you have a wonderful afternoon. It was a pleasure to contribute a little although the organising committee did a fantastic job so you all deserve what you got out of it, brilliant. At its peak you could see the villages heart beating, it was great. Thank you so much for inviting us to your celebrations. It was lovely mingling amongst so many lovely people and seeing so many smiling faces enjoying the day. The community spirit was alive and well in your lovely Mapperley village. Seeing the support that you got, must have given you and all of the other organisers and volunteers, much satisfaction after all of the hard work that you all must have put in. Each and everyone must be proud of the enjoyment that they gave to the visitors to your historical event, The 750th. Charter. 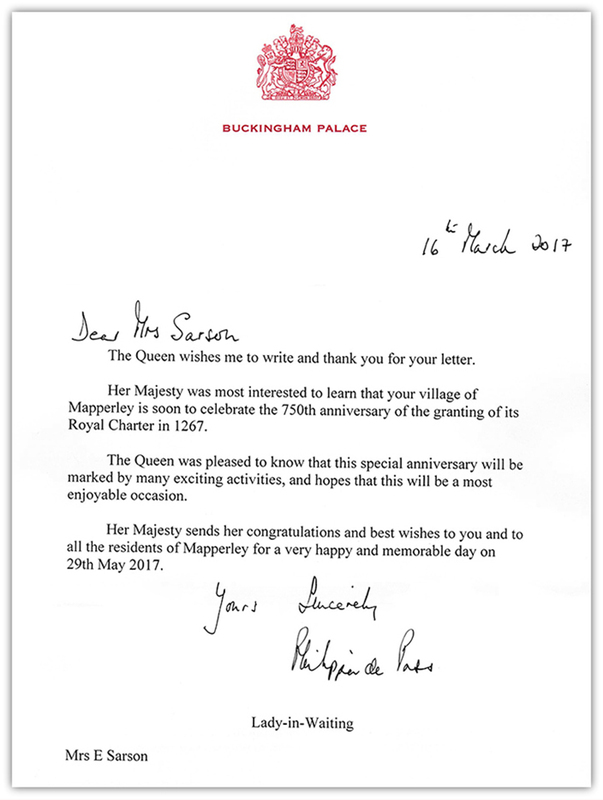 I am sure the King would have been proud at the attendance, celebrating his charter and would have said " Well Done Mapperley" and a Big Thank You, to all who attended..
A massive THANKYOU to the committee for organising such a brilliant event. I loved the day, & so did everyone I’ve spoken to that came, brilliant. Congratulations to you all, isn't it about time you started planning the next event?? ha ha!! 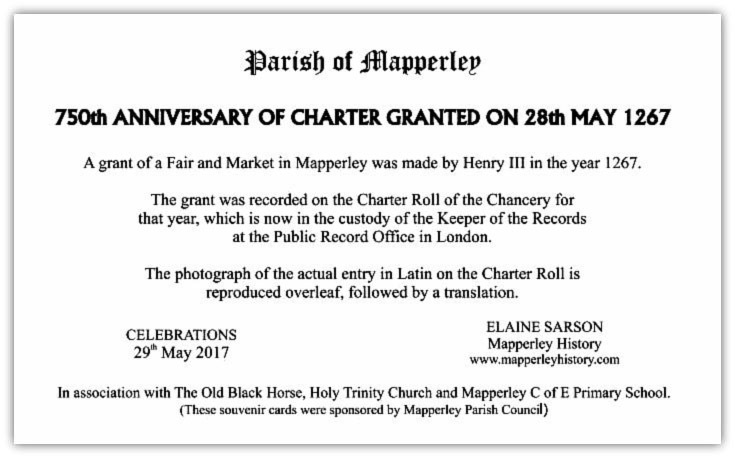 Just had to thank yourself and everyone in Mapperley for celebrating this 750 anniversary of the Royal Charter and organising such a super event. The weather was not quite as bad as 50 years ago, as I did make a few shillings towing cars off Pool Close field car park opposite Mapperley Farm in 1967. It was great to see so many people attending and I am sure a good time was had by everyone. I didn’t know about it until Monday morning when it was announced on Radio Derby and felt that I had to come and share in the celebrations. I just wanted to say how much Peter and I enjoyed yesterday. A lot of hard work must have gone in to that day by you and lots of others. Thank you for all the effort by no doubt many people. Wishing you all the best and a quiet week. We had a great day. The church was extremely well attended. We had literally hundreds coming through the doors during the afternoon. Our stalls and refreshments did very well and everyone was more than happy. What a fantastic event, you should be very proud how it went. 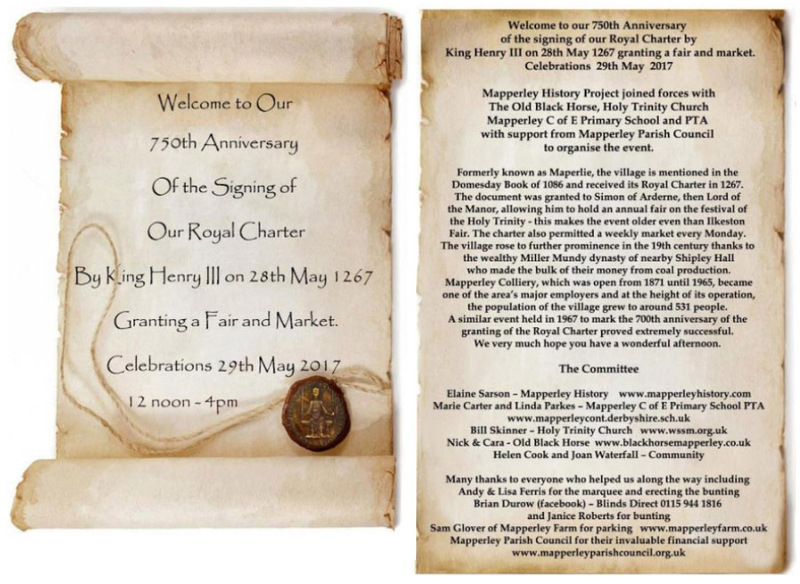 At our 750th Royal Charter Anniversary Celebrations in May 2017 I was approached by Tim Corser of Stanley who had bought along a priests bell and the book in which it is mentioned. The book is Bill Wyman’s ‘Treasure Islands’ Yes, THE Bill Wyman of the Rolling Stones who has been an avid metal detectorist for 20+ years as he has a large manor house in the Home Counties and has found lots of interesting items there. 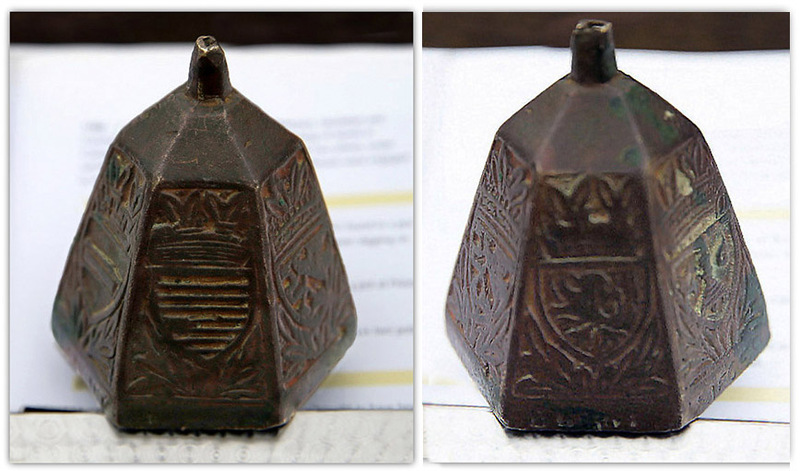 1987 – 13th Century Bronze Bell was found under a tree about 300 yard from a moated manor house : finder Tim Corser. The bell was six- sided, each side decorated with coats of arms and inscribed with the names of Belgian towns. The British Museum dated it and identified it as a priest’s bell valued at about £100, it was returned to the finder. The British Museum said that because of its location and the inscription and coats of arms, their opinion was that it probably belonged to the personal priest of Simon of Arderne. 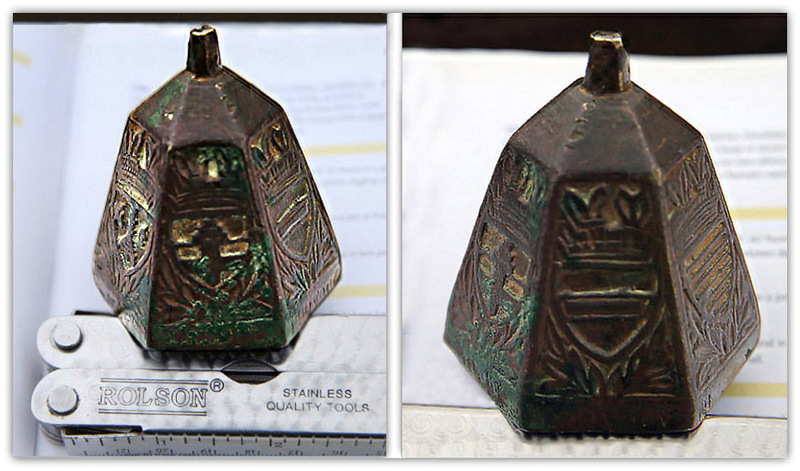 Tim found the bell in 1987 when using a metal detector on land of Bridge Farm, Mapperley Lane. Many thanks to Tim for allowing me to share this information.